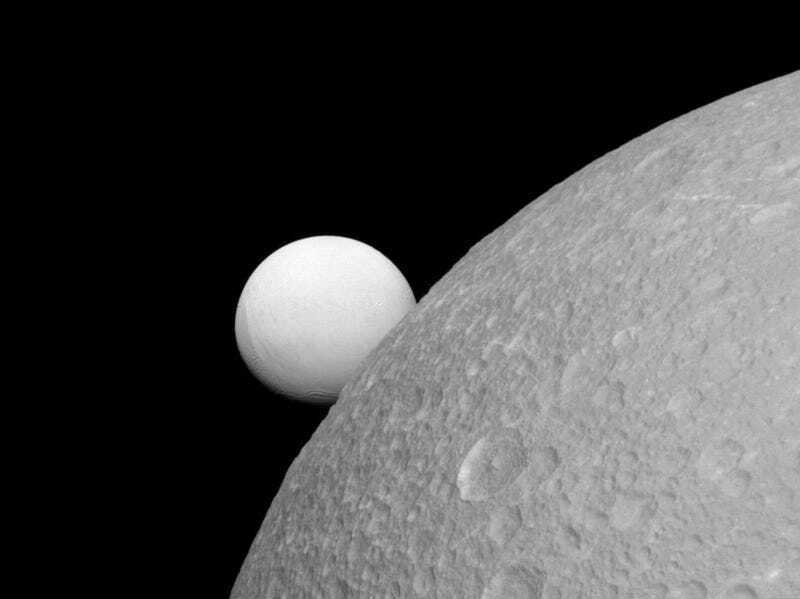 Is anything more striking than this family portrait of Dione and Enceladus? The two Saturnian moons are night and day when you put them side by side, and yet they’re made from the exact same material. Both moons are largely ice, with a dense, rocky core composed of silicate minerals. But while Enceladus (background) is a smooth white snowball from afar (up closer, you’d see craters on its north pole and cracks across its southern ice sheet), Dione’s surface is darker, and distinctly battered. The difference between these lunar siblings has to do with geologic and atmospheric processes. On Enceladus, a south pole geyser system spews up salty water from a subsurface ocean, sending ice particles high into the moon’s thin atmosphere and giving it a shimmery glow. Some of this ocean powder ends up back on the ground like fresh, white snow. It’s a different story on Dione, which, unlike its kid brother, isn’t blessed with underground oceans and dynamic ice volcanoes. (It’s okay Dione, we can’t all be Enceladus). Much like our Moon, Dione’s surface accumulates signs of age as it’s hit with space radiation and flying debris. Dione was discolored long ago, as Saturnian dust slowly accumulated from the local gas giant’s ring system. Dione is only 1122 km (697 miles) in diameter, while wee Enceladus is less than half that size. This lovely image of the pair was acquired by NASA’s Cassini probe, at a distance of 52,000 miles (83,000 kilometers) from Dione.